Hubbell Wiring Device-Kellems provide Configurable, Pre-wired Devices for multiple Resident Wiring and Commercial Electrical Applications. 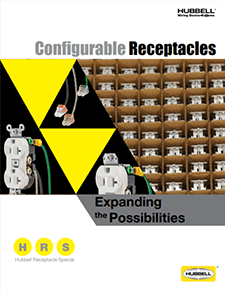 Our Configurable Receptables provide Electrical Contractors and Engineers with options from basic Hubbell Connectors to 3-way Rocker Switches. Our most popular 15 and 20 Amp standard receptacles are ready to meet your service, installation and design specifications. Ordered as a Hubbell Receptacle Special, our Duplex and Style Line® Decorator, Tamper-Resistant, Hospital Grade and SNAPConnect® are made to spec and modified to speed installation. All orders arrive in bulk packaging ready to install out of the box. Contact your Hubbell sales representative to discuss your customization needs. After an order is placed, the receptacles will be made to specification, inspected, bulk packed and shipped. Factory produced and delivered on time to keep your project on schedule!